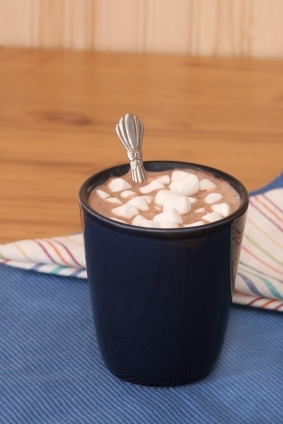 I have more than just homemade hot chocolate, check out more recipes at the end of the page. If you have never tasted old-fashioned hot chocolate, you are in for a treat. Rich, smooth and creamy, it's a dreamy beverage when it's cold outside. It's easy to make and will save you money. Blend cocoa, sugar and salt in a 1-1/2 quart saucepan. Gradually add the hot water. Boil over medium heat for two minutes, stirring constantly. Add milk and heat thoroughly, stirring constantly. Do not boil. Remove from heat and stir to blend with a spoon. Serve hot with marshmallows on top. Makes three 6 ounce servings. In a double boiler, add the milk chocolate and butter. Slowly melt and stir until well combined and smooth. Stir in the vanilla extract. SLOWLY add the half and half. Incorporating it gradually as it heats - DO NOT BOIL. Serve with a handful of mini marshmallows and a garnish with a touch of nutmeg. May also add my homemade coffee liqueur (Kahlua). Delicious. Variations: dark semi-sweet chocolate or white chocolate. With the dark chocolate you may add Cointreau and with the white chocolate; peppermint schnapps.